The modern urbanite lifestyle keeps us hectic all day, running from one task to another with barely enough time to take a break. With this, it’s increasingly important to eat right, if you want to stay healthy and alert all day. Whether you have long-term fitness goals or just wish to cleanse your diet, it is important to pick the right types of food to go with your meals. As the saying goes, you are what you eat, so it makes perfect sense to put in more variety and color into your everyday meals. Among all your food options, plant-based foods are not only filled to the brim with nutrition, including proteins carbohydrates and fats, they are also rich in vitamins and minerals. These can all be vital in maintaining optimal energy levels. Today we will be looking at some of the most popular boosters for your everyday salads, all of which are natural and plant-based. Almonds are the most nutritionally dense food in this list and contain the highest nutrients per calorie compared to all other superfoods. It has a little bit of everything including potassium, calcium, vitamin E, magnesium, and iron. Almonds can also be a great protein source, as well as healthy fats and arginine. Arginine can help boost your metabolism rate during workouts, and even lower blood pressure and reduce cholesterol levels. If you find plain almonds boring, you can always add them to yogurts or greens as a topping. Also, almonds can protect against heart diseases. Blueberries are extremely rich in antioxidants, which can slow the effects of aging on your body. Antioxidants can also reduce the risk of heart diseases, cancers, and inflammation. Not to mention, it is a naturally sweet delicacy on its own, and a great source of vitamin C. Some studies have even shown blueberries to not only lower blood pressure and cholesterol levels, but it can also help to improve one’s memory. You can never go wrong with adding some blueberries to your everyday salads. Cabbage is a superfood that is rich in vitamins and minerals. It is also rich in fiber and can help to cleanse toxins in our bodies. It is one of the most underrated among all superfoods, as it looks plain as a leafy vegetable. However, beneath the unassuming greens lies many vitamins and minerals among other nutrients. It can keep your body’s inflammation in check, boosting your body’s ability to heal and maintain itself. Cabbage is also rich in vitamin C and gut-friendly insoluble fiber, which can both help to improve overall digestion. A favorite way to enjoy them is to use them fresh as an outer wrapping for salad rolls. Carrots are an excellent source of beta-carotene, vitamin K, potassium, and antioxidants. Specifically, beta-carotene gets converted to vitamin A in the body, an essential supplement to our bodily functions. Pectin lowers blood sugar levels by slowing down the digestion of sugar and starch. It also contains biotin for fat and protein metabolism. Consumption of carrots can reduce the risk of cancer, while also lowering blood cholesterol. Most of all, it has a high satiety index which means they increase satiety. This leads to decreased calorie intake in subsequent meals and is an ideal booster for a weight loss diet. Sunflower seeds are one of the handiest boosters that you could add to not just your salad but any other meal, or as a snack between meals. Despite having minimal calories, they are packed with nutrients and minerals and can help you feel full for longer periods of time. They are also high in naturally occurring polyunsaturated oil and can have anti-inflammatory effects on your digestive system. On top of that, it can also benefit cardiovascular health. Last of all, sunflower seeds also contain phytosterols, which can help to lower cholesterol levels. Adding sunflower seeds as a booster to your salads can help to calm down your nerves, muscles and blood vessels, and improve overall health. Spinach greens are not only low in calories but also jam-packed with nutrients. It is a good source of iron, an essential mineral that is needed in blood production, as well as anti-inflammatories like calcium and vitamin K that promote vision and bone health. Spinach is most often used as a sandwich base or served raw in salads, a powerful booster food in itself. Beet contains many vitamins, minerals, and antioxidants, which can help combat diseases and fortify vital organs. Beet has been shown to reduce blood pressure, increase metabolism and protect against colon cancer. Specifically, battalions which give beet its purple color helps ward off colon cancer. Tomatoes are one of the juiciest vegetables with 95% water content. It contains the antioxidant lycopene, which is linked to reducing the risk of cancer and heart disease. It is also a great source of potassium, vitamin C, folate, and vitamin K. Mix some tomato slices into your salad and you’ll also enhance the flavor of the salad. Achieving good energy levels throughout the day is more than just focusing on the latest food trends, but takes a balanced diet of a wide variety of superfoods every day. Moreover, when you eat right, you will have fewer cravings and will effectively consume fewer calories, while being just as energetic if not more so than before. The foods listed here are easy to absorb by the body and are ideal when paired with your salads. Rich plant-based foods keep your energy levels constant without crashing or burning out. They sustain a healthy lifestyle and help to nourish your body, while also being versatile enough to consume them multiple times a day in different meals and servings. Include these as part of your balanced diet, and you’ll be on the way to improving your nutritional health. 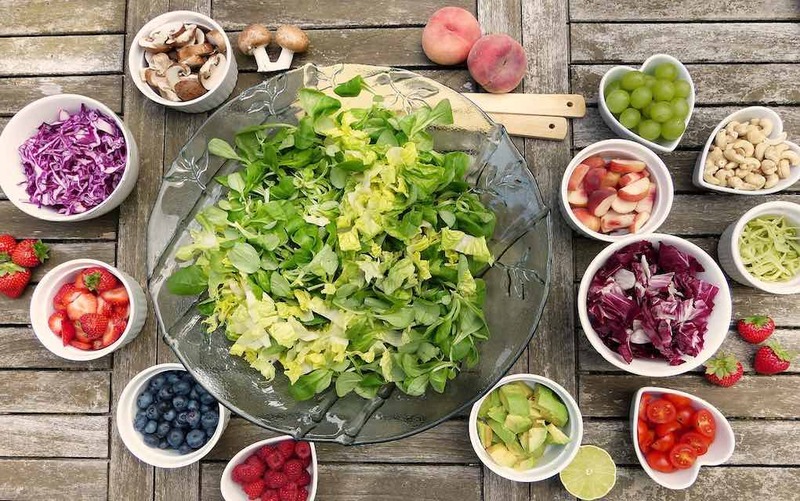 Drop the impression that salads have to be bland and boring, and start adding these boosters into your everyday greens to spice up your healthy diet! To learn more about making healthier choices every day, subscribe to our newsletter. Author Bio: Jessica Ann has written many blogs across the spectrum, but specializes mainly in weight loss and dieting. With several years in the field, Jessica has been helping people get healthy and fit with the help of drtohelp.com and is dedicated to providing information for those who need it.